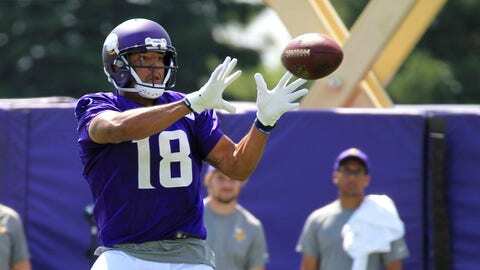 A hamstring injury that forced Minnesota Vikings receiver Michael Floyd to miss Week 7 may have cost him a growing role in their receiver corps. Floyd returned for the Vikings’ 33-16 win over the Cleveland Browns in London but played just six snaps on offense. He hauled in his only target for a seven-yard catch, and has now been targeted just five times this year in three appearances since serving a four-game suspension to start the season. Adam Thielen was the Vikings’ most active receiver for the eighth consecutive game, playing on 92 percent of the offensive snaps, while Stefon Diggs — in his first game back from a groin injury — logged 75 percent. Laquon Treadwell, the most direct threat to Floyd’s playing time, was on the field for 36 percent, while Jarius Wright finished at 16 percent. Thielen and running back Jerick McKinnon were each targeted 10 times by quarterback Case Keenum, accounting for nearly 60 percent Keenum’s total passing output. That production came at the expense of Diggs, who caught four his six targets for just 27 yards, or 6.75 yards per catch. — Tight end David Morgan played a season-high 42 percent of the offensive snaps. — McKinnon out-snapped Latavius Murray for the seventh time this season. Murray hasn’t had a larger workload than McKinnon since the Vikings’ Week 4 win over the Detroit Lions. — Safety Harrison Smith is now the only member of the Vikings’ defense to play on every defensive snap this season.